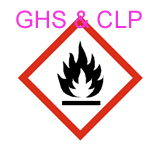 CLP stands for the Regulation (EC) No 1272/2008 on the Classification, Labeling and Packaging of substances and mixtures. CLP introduces the United Nations globally harmonized system (UN GHS) for classification and labeling of chemicals into Europe. CLP entered into force on 20th January 2009. The technical annexes of CLP Regulation, as well as certain articles, will be updated from time to time to ensure they are kept as comprehensive and accurate as possible – this is done through the EU comitology process. The amendments are known as adaptations to technical progress (ATPs) to the Regulation. The 5th ATP(draft) was notified to WTO in december 2012 to propose to update the classifications of over 40 substances (for example, vinyl acetate & Nitrobenzene) in Tables 3.1 and 3.2 of Annex VI of CLP regulation. The draft regulation is expected to come into force from 1 January 2015. Use of harmonised classification and labelling set out in Tables 3.1 and 3.2 of Annex VI of CLP regulation is mandatory in Europe. It is very important that companies follow the updates of CLP regulation to ensure that they are using up-to-date classification criteria or harmonized classifications. The 4th ATP to CLP was published on 1 June 2013 and it brings the CLP regulation into line with the 4th revised edition of the UN Globally Harmonised System (GHS). The update introduces new classification and labelling criteria for chemically unstable gases and non-flammable aerosols. Amongst other changes, there are also new rules on the labelling of products that are corrosive to metals and of those in containers of less than 10 ml. Suppliers have to apply the 4th ATP to substances from 1st December 2014, and mixtures from 1st June 2015. The 3rd ATP is published in July 2012 and it updates the classifications of 16 substances (for example, 2-ethoxyethanol) in Tables 3.1 and 3.2 of Annex VI of CLP regulation. The will come into force on 1 December 2013. However, companies can adopt those updates on a voluntary basis prior to 1 December 2013. The 2nd Adaptation to Technical Progress (2nd ATP) to the CLP Regulation is laid down in Commission Regulation (EU) No 286/2011 which entered into force on 19 April 2011. It includes various scientific-technical changes to the Annexes to the CLP Regulation. The main purpose of this regulation is to align CLP regulation with the 3rd revised edition of UN GHS. The changes relate, inter alia, to the labelling provisions, new sub-categories for respiratory and skin sensitisation, the revision of the classification criteria for long-term hazards (chronic toxicity) to the aquatic environment and the hazard class for substances and mixtures hazardous to the ozone layer. The 1st Adaptation to Technical Progress (1st ATP) is laid down in COMMISSION REGULATION (EC) No 790/2009. The regulation was issued on 10th Aug 2009 and entered into force on 01st Dec 2010. The regulation brings the entries from the 30th ATP & 31st ATP of Directive 67/548/EEC into Annex VI of CLP, resulting in the update of harmonized classifications in annex VI of CLP.